Figuring Out Your Child's Gender Identity | Breezy Mama Breezy Mama - Expert parenting advice, celebrity interviews, product reviews for kids, moms and babies and more! High heels or sneakers? Which shoes do your boys wear? And do your girls wear pink tutus? WIN!! 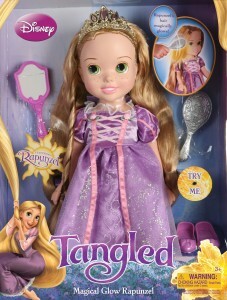 Disney is giving away one Tangled Rapunzel doll–see bottom of post for details. Are trucks for boys and dolls for girls? Does society say it’s okay for your boy’s favorite color to be pink? Breezy Mama Contributing Editor, Robyn Lass, finds out. . .
I’m sure I’m not alone in wondering how gender identity develops in young kids. As a mother to a preschool age boy who adores “The Little Mermaid” I was starting to feel a little confused about what I should or shouldn’t say when he asked to play with toys that typically fell into the “for girls” category. I needed some answers so I went to child psychology expert Linnda Durre, Ph.D. A former nursery school teacher, now a psychotherapist with her own practice, she had some great insight and suggestions for parents curious about gender identity and the toys our kids choose. At what age do children begin to differentiate gender? How can parents, teachers and caretakers best help them understand the concept of gender? Parents should be open and encouraging about limitless capabilities of boys and girls – men and women – from astronauts to caregivers to fire fighters. Show them photos, take them to museums, read books with precedent setters in gender, like Sally Ride as an astronaut as well as male astronauts, chefs who are male AND female, dress designers who are male AND female, etc. Bathroom separation is a good way to teach children about boys and girls needing separate facilities. As a former nursery school teacher, what did you observe in the classroom when it came to playtime and gender identity? Girls gravitated more toward the doll corner and the playhouse, unless they coerced or corralled some little boy to play “the husband” while playing house. Some boys volunteered to play – other boys wanted no part of it and wanted to be outside playing when they could. Boys gravitated towards playing with trucks, using trikes–large muscle activities in general, climbing, etc. Both liked books, art projects, reading, learning ABC’s and numbers, playing outside, tag, etc. Is this a controversial topic among child experts? I think it is an important area to be studied and feminist oriented psychologists, researchers, etc. may have made this a topic of interest – what is defined as “Male” and what is defined as “Female.” It is also the nature vs. nurture argument. What is hormonal, biochemical, genetic vs. learned behavior, role modeling, etc.? Are there things parents should or shouldn’t do during these developmental years as children start to choose what they like to play with? i.e., if a boy likes to play with dolls and/or a girl likes to play with army men, what’s the best tactic for a parent? Many therapists might say that the parents’ worst fear of a little boy playing with dolls is that they may worry that their child is gay and for some parents who are of certain religions, they may feel it is wrong, perverted, sick, bad, Satan’s work, etc. Many times, what a parent makes taboo or a “no-no” only creates even more interest, fascination, and even obsession with something. I would say ASK the child WHY they like playing with certain toys, dolls, and games. Find out what their interests are, their motivations, their curiosity and help them explore their interests. Observe their play. If they feel the child is depressed, too angry, lethargic, etc., perhaps a child therapist may be of help. There may be a need for vitamins, better nutrition, etc. Other points to ponder – Why is G.I. Joe called an “action figure” and not a doll?!?! It may be because parents may be concerned that their little boys will become gay if they play with “dolls” but calling it an action figure is macho, masculine, and heterosexual rather than anything that may convey femininity. A little girl who is a “tom boy” is more acceptable than a little boy who is a “sissy.” It has to do with power and gender. And when and how do they start to typically associate certain things (clothing, toys, etc.) as “for boys” or “for girls”? I’ve heard nursery schoolers can say “That’s for boys!” or “That’s for girls!”—there is a gender awareness at an early age. How should parents respond to statements like “that’s for boys” or “that’s for girls” from their preschooler? Parents and teachers can say, “Well, some boys like to play with that. It’s not just for girls” or “Girls can play that game, too. It’s not just for boys.” They need to encourage open mindedness in their own children and, if they are teachers – in their students. Is there any reason to believe that toys children choose in early years affect their understanding of gender or their sexual orientation down the road? Some researchers feel sexual preference is bio-chemical, hormonal, and has nothing to do with what toys they play with when they’re young. Many gay clients I know say they knew they were “different” or attracted to others of their own gender or many say they knew they were gay when they were as young as 4-10 years old. As a rule of thumb, should parents be open to allowing their children the option to explore all types of toys and play? YES! Limiting children’s curiosity and interests only stifles their intelligence, creativity, competence, assertiveness, and mastery. If you refer to the Bem Research and Bem Scales – (Sandra Bem, Ph.D. and Daryl Bem, Ph.D. who were at Stanford University when they did this research as I recall) – they found that the most adept, flexible, self-reliant people had a solid mix of “feminine traits” and “masculine traits” – could earn their own money, change a diaper, cook a meal, do their laundry, etc. – I’m shortening and paraphrasing years of research. Are there any books on this topic that you’d like to recommend for parents? “Beyond Dolls & Guns – 101 Ways to Help Children Avoid Gender Bias,” by Susan Hoy Crawford. $17.13. Click here to purchase. “Pink Brain, Blue Brain: How Small Differences Grow Into Troublesome Gaps — And What We Can Do About It” – Lise Eliot, Ph.D. $10.17. Click here to purchase. About Linda: Linnda Durre’, Ph.D., is a psychotherapist in private practice in Orlando, Florida. She holds three K-6 teaching credentials (NY, NJ and CA) and has taught in nursery school, kindergarten and first grade. She can be contacted at 407-739-8620 or by email at Linnda.Durre@gmail.com and on www.experts.com. Breezy Mama Note: For those of you who have sons that would rather wear sparkles, dresses and anything pink, you may want to check out the book “My Princess Boy.” My Princess Boy opens a dialogue about embracing uniqueness, and teaches you and others how to accept young boys who might cross traditional gender line clothing expectations. $12.60. Click here to purchase. WIN!! Disney is giving away one Tangled Rapunzel doll to a lucky Breezy Mama reader. For chance to win, tell us (in the comment section below) if your child sticks to their gender’s toys while playing. One comment will be chosen at random. This contest is now closed. with having 3 kids (1 girl and 2 boys) they play just fine with each others toys. at times i will see my boys play with pet shop with my daughter other times i will see my daughter play super hero’s with the boys, my boys have dressed up in a dress/tutu before. i have seen my daycare kids, the boys, dress up as girls before. i let them its only natural to explore the world around them. i even bought my son a boy doll when we found out that we were pregnant with our youngest. My 3 yr old daughter loves her dolls! That being said, I wonder if her thoughts would differ if she had a brother. As a mom of boy/girl almost 3 year old twins, I’m always encouraging my kids to play with one another. My daughter is obsessed with everything pink, sparkly, and princess. My son loves his cars, trucks and trains. With that being said my kids are constantly playing dress up where my son is the princess as his sister pretends to put makeup on him. In the same token, my kids also play monster truck mash up in the dirt. I think it’s good to encourage imaginative play and don’t worry so much about if it’s a gender specific activity. My daugther who is going to be 4 in January has stuck to Princess playing. But she also had a period where she played with Thomas the Train all the time. I think it’s healthy to play with all things but I think the sterotype is harsher on boys playing with girls stuff than the other way around. My son is only 8 months old so he is really interested in just anything that makes noise! As for my stepson, he loves video games and play fighting but HATES things that his dad expected him to be more interested in like sports. We picked him up from school recently and while all the boys were playing soccer, he was sitting on the bench with all the girls. He likes to dance and wants to learn to knit. Now that I think about it, he really doesn’t like to play with a lot of toys… I wonder if that would change if he had toys that may be geared more towards girls. My 5 year old daughter generally sticks to girl play but she does also have Matchbox cars along with her dollhouse. I have no problems with that. I think it’s healthy for children to get in as much play as possible. I also think it’s okay for boys to play with “girl” stuff. I baby sit a neighbor boy who is 4 years old. He loves playing with my daughter’s dolls and dollhouse. They are using their imagination no matter what. My daughter is 4 1/2 and she plays with all toys. Although, she is a girly girl , she will get down and play in the mud too. She has her dolls and her cars and trains too.I think it is healthy to allow her to play with both gender toys and allows her to interact equally with both boys and girls. My mom took her too see Tangled over Thanksgiving weekend and she loved the movie! She would be very blessed to receive the Tangled doll (of course it is on her wish list). My oldest child, a boy, has primarly played with “boy” toys, because that’s all we had in the house for the first few years. Since our daughter has come along, she has shown great interest in her brother’s “boy” toys. Although, her favorite toy is her baby doll. They are inseperable. My kids play with everything because they have a wide selection of friends and I’ve never said anything about girls not playing with trucks or boys playing with princesses. My son is pretty rough and tumble but takes time to play kitchen and tea party with his little sister. My almost 3 yo girl is Very Girly but enjoys wrestling, matchbox cars and playing in sand and dirt. No hard lines here. My 4 year old daughter loves girly things. She always has. That being said, she has no problem playing with her 20 month old brother’s “boy” toys, like trucks, trains, tools. My 20 month old son prefers all the girly toys at our house right now. He loves his sister’s dress up clothes, struts around in princess heels, loves to feed her babies or push them in the stroller. My 4 yr old granddaughter loves Barbies, princess dress-ups and the color purple. She likes to dress in a sporty way for play and I don’t know if I have ever seen her play with a truck or “boys” toys. She does enjoy sports but music and art are favorites too. My kids have always tended to play with their gender-toys. My son likes action figures and my daughter loves princess and anything pink. My daughter loves all her baby dolls, but she only has girl toys but if we are around boy toys she will play with those also. I have 2 boys (9-1/2 & 7) & twin girls (3) & have found that all four of my children (at different points), have played with & enjoyed toys that are not gender-specific. While my twin girls love baby dolls & all things girlie, they also really like to play w/their brothers’ superhero toys as well. My sons also have played w.their sisters’ dollhouses (even putting their action figures in them!) & will engage in tea parties w/their little sisters. I think it’s important to expose children to toys & activities that aren’t specific to their gender. We went to disneyland this past week and it was so fun to see my two year old son just as excited to meet the princesses as my 5 year old daughter. That being said, recently, the toy that both of them have loved the most is a big cardboard box. my boy loves playing in his sisters patented leather shoes, barbie, and my little pony! i dont mind it at all. when it comes to cars and trucks hes all boy!!!! We allow our daughters (six and three) to play with any toy imaginable. Their bedroom is gender neutral in decor and filled with a variety of toys – trucks, blocks, dolls (both boy and girl dolls), action figures, easels, etc. I have a minor in Women’s Studies and learned in a Psychology of Women course the importance of encouraging gender neutral play. I have one daughter who admittedly does gravitate more toward dolls and all things pink…. and the other prefers Legos and dump trucks. But a range of toys are made available to both. i think this becomes more of a contentious issue as kids get older – while most people think it’s cute if a 3 year old boy dresses up in his sister’s princess costume, the same is not said when a boy gets older. i have an 8 year old son who has always lived (as our family says ) in “technicolor” – he loves anything bright and sparkly and laments that boys have so few fashion choices (it’s all so drab – grey/brown/blue – and boring). he also loves dolls (not barbie/dress up, but playing “dad” and changing the baby etc) and takes ballet (he has a solo in his recital this weekend 🙂 ). this has become a serious issue in the past year. people (adults!!) can be cruel and rude. the neighborhood kids are especially mean. what kills me is that parents are teaching their children that there is something wrong with kids who are “different” and even when the parents see their kids taunting my son, they do nothing about it (though i have no problem sternly telling a 9 year old to stop being so rude) even though my son plays baseball, loves to get dirty and play in the mud, plays with cars/trucks/nerf guns he also loves the “girl” things i mentioned before. i don’t get why people can’t embrace all of these things. i fear that the older he gets, the worse he will be treated.